Office style meets casual chic – cool cuts in statement fabrics. This collection from the 02/2019 issue of BurdaStyle magazine is plus-size fashion with 24-hour looks that make you always look perfectly dressed. Casual Friday? You will be perfectly dressed in this outfit. For a practical look, simply pair the look with a white blouse on top. 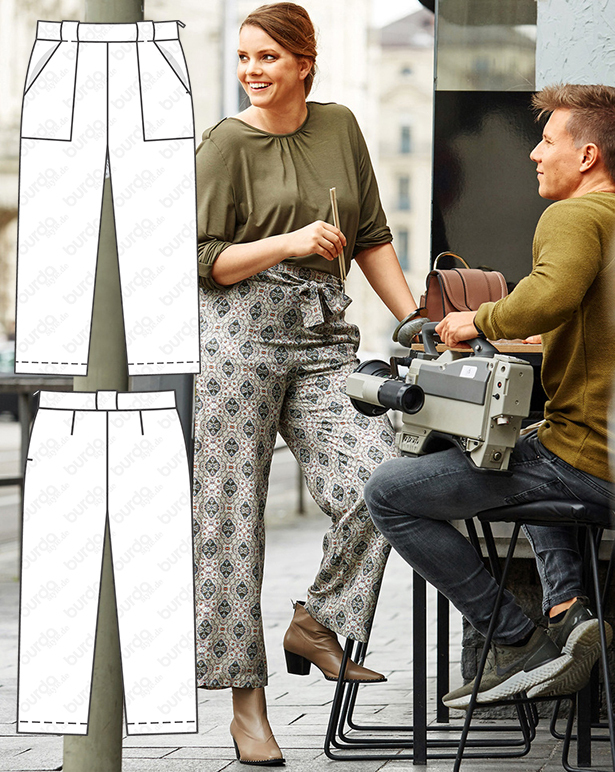 The solid color trousers with the oversized slant pockets are extra cozy – and the tying belt adds a style splash. Yep, gotta have it! This tunic with sophisticated pleats at the neckline and balloon sleeves is sure to be a favorite piece. The rounded hem with side slits plays lightly around the hips. Style tip: pair it with slim-fit trousers for a great combination. One dress, three looks: Start your morning with pumps and a blazer for the office, then pull on the sneakers and a denim jacket around the city. Wrap the busy day with some statement jewelry for the evening. Patch pockets on the bodice and a placket band grab attention. A band at the waist beautifully shapes the silhouette. Fine details like the gathering at the neckline, and sleeve tabs with the gold buttons are special touches to this basic shirt. A soft jersey hugs the curves. A solid color and a casual tuck at the waistband is a great style with trendy trousers in a leopard print. Comfortable and so chic! The relaxed cut and flowing fabric add a visual length to the legs. An ideal style choice: shoes with a slight heel. The decorative tying belt can be worn draped or tied. This long jacket with its drawstring casing, zipper closure and slant pockets is a sewing project requiring some patience. The result, however, is the reward of a beautiful and remarkably comfortable fashion staple that also includes a tying belt to bring it close to the figure – or to let it be relaxed. Wow! This printed cotton style makes the tunic glamorous – and ready for a night out. The V-neckline draws attention at the neckline and the decolleté, while the well-placed pleats and balloon sleeves add an extra polish to a fresh look. 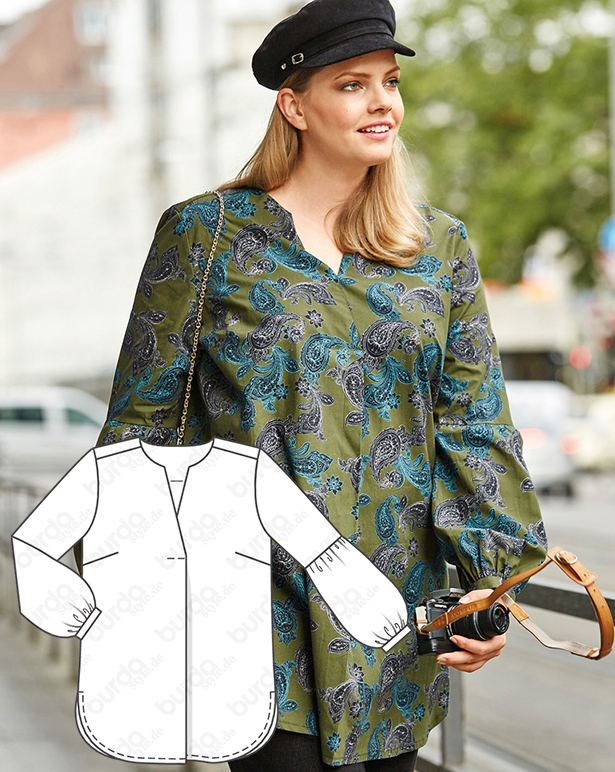 Sew up all these plus size looks with the discounted pattern collection bundle here! I love the tunic. It is perfect for recycled silk sarees or embroidery. Off shoulder dresses that don’t cover bra straps or plunging necklines are impossible for daily wear. Thank you for the more conservative style that looks better on older women. I will be adding a bib front to eliminate the bust darts and add visual interest. Really? Sacks cinched at the waist? Come on, Burda. A baggy tunic with unflattering sleeves? The basic Jersey top is nice, I’d give it a flattering modest V-neck though. I agree, these are definitely sacks. Hope next months designs are better.